Sellwood resident Nora Burkharts-Meier, a Senior at Cleveland High School, has been playing classical piano since she was six years old. She has also been writing and singing songs since she was twelve, and she is planning to pursue BA degree in Music after graduating from CHS. And, since last year, she has been the Master of Ceremonies at a Youth "Open Mic" program at Artichoke Music on Powell Boulevard to help showcase local student talent. "At first, our program was at McMenamin's Barley Mill Pub on S.E. Hawthorne, but since that was kind of noisy we were pleased to make connections with Café Artichoke, at 2007 S.E. Powell Boulevard," she says. "It's also closer to CHS." 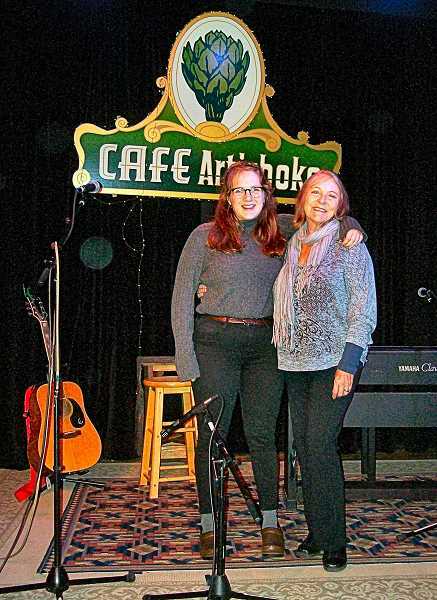 Nora made contact with Artichoke's Artistic Director, Alexa MacDonald, and the Youth Open Mic program has been held at Café Artichoke on the second Tuesday of every month since October, 6:30-9 p.m. "We've featured singers; composers on keyboard, guitar, and ukulele; and even some poetry, and stand-up comedy," she reveals. MacDonald, Artichoke's Artistic Director for nearly two years, had also been working with PROWUS – a nonprofit that raises funds for students who want to take music lessons but can't afford them. "PROWUS ('Portland Rock On With Us') gives out scholarships twice a year, and helps coordinate the Youth Open Mic program," explains MacDonald. The December program was a bit slim, since it was competing with Cleveland's Band and Choral Concerts in the same week, but Nora observed that the month prior there were over a dozen performers. "It's a great opportunity for students to practice performing on-stage, in front of an audience, learning the ins and outs of presentation, projection, and acoustics," she remarks. Nora has been making connections with student musicians at Cleveland Hagh, and recently learned that she has been accepted for a "Sound Off" program in Seattle in 2019. "It's kind of like a 'Battle of the Bands' for performers under 21!"